The Wheeler School was founded in 1889, the inspiration and life-work of a visionary educator, artist, and activist named Mary C. Wheeler. Miss Wheeler, as she was always called, believed her girls deserved a challenging and rigorous curriculum more substantive than the “finishing school” approach typical of the age. An innovator, even rebel, Miss Wheeler brought her students overseas to paint — living next door and becoming acquainted with Claude Monet. Wheeler developed an urban campus in the heart of Providence to benefit from the proximity to Brown University, and purchased a “Farm Campus,” 15 minutes away, to serve as a “rural counterpoint” where her growing crop of day and boarding students could study botany, biology, and astronomy in a pastoral environment. From this beginning more than 125 years ago, grew the coeducational, Nursery-12 day school of today. Photo above by Bob Martin at the 2014 celebration of our Quasquicentennial. ". . . A recognition of what underlies the school, a purely spiritual event, was the choosing of the school motto, The Spirit Giveth Life. In the classes there was continual emphasis laid on the truth that the spirit in which we seek knowledge and share our findings gives life to our learning. All the school groups, in considering the basis of our life together, had discussed the fact that the mere literal observing of rules was not a sufficient motive for conduct, that the best guide is rather a constructive spirit, one of consideration for others and a desire for the welfare of the whole school. I had used on a Christmas card the words, The Spirit Giveth Life. The upper classes, the student council, and finally the whole school discussed it and asked the trustees to make the words the official school motto. This was immediately approved and since May, 1933, has become an inspiring watchword for all of us." Founder's Day 2017 from Wheeler School Broadcasting on Vimeo. 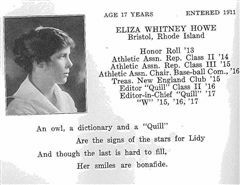 Seventeen may seem pretty young to pen the words to a song that celebrates its centennial in 2017, but for Wheeler student Eliza Whitney Howe (later Keith), the words to the Wheeler School alma mater came easily. At the time of the “official” founding of the School there was no “official” school song. That changed in the winter of 1917, according to the Wheeler Archives, when the Senior Class offered a prize to the student who could write the best school song. The official Wheeler School seal that is used today was created in 1945-46 by noted artist John Howard Benson of Newport, RI, described at the time as the 'greatest calligrapher in the world." (Benson also did the lettering on the tablet marking Wheeler Memorial Hall.) Writing in a school newsletter about the "new" seal, Headmistress Mabel Van Norman, who commissioned the artist, said: "Throughout the ages, in the art both of the East and the West, a flame has symbolized the spirit. In Oriental art it is seen in the haloes of Buddhas and in the aura within which the Hindu sungod Siva dances...In western art it is used frequently to symbolize the Holy Spirit at Pentecost. The flame fittingly symbolizes the spirit because it has no substance, it has a shining quality, it penetrates darkness, it gives warmth and it is necessary for life. Plato refers to the flame as a symbol of light, of intelligibility, of clarity. May our school motto and its symbol inspire us to even higher attainment of these qualities of the spirit which will bring an ever better life to our school and its members." Wheeler School 125 Photo Celebration from Wheeler School Broadcasting on Vimeo. An Aerie independent study project by John Snider '12 and James Scoliard '12 and Aerie teacher Patrick O'Connor.